Time of realization: February 25 - 27, 2009. Advance and use of modern marketing tools as catalysts of the Russian composite market, development and introduction of composite technologies and materials in different branches of industry - here are the main purposes set before the organizers of the second international specialized exhibition “Composite - Expo”. On February, 27, 2009, having successfully completed its work, “Composite-Expo 2009” clearly demonstrated that it had managed to solve the problems posed by both the organizer of the exhibition, Exhibition Company “Mir-Expo”, and the exponents. The main sections of the exhibition were as follows: raw materials for composite materials’ production (resins, glass fiber cloth); additives and modifiers; equipment and technologies for composite materials’ production; composite materials’ treatment tooling, glass-fiber, artificial stone, artificial marble, organic concrete; manufacturing technologies for composite materials with special and defined properties; bonding of composite-based products; surface treatment technologies; composite-based industrial products, composite materials’ use in construction and housing and communal services. The exhibition has grown as compared to the previous year. It occupied more than 1000 sq. m of space, the number of exponents was 54, including 20 foreign companies from the USA, Germany, France, Italy, Finland, Turkey, Hungary, Macedonia, China, Ukraine, Byelorussia. Such companies, well-known in the industry, as OCV Chambery International, Evonik, Lectra, Science & Technology Testing Center Apatech-Dubna Savelovo Machine-Building Plant JSC, «Mikrosam», Polotsk-Steklovolokno, JSC, AB Universal, LLC, Safit, JSC, Chimex Ltd, Zoltek ZRT, Ranger Italiana, European Transport Systems, LLC, CNBM International corp., Intrey, LLC, Fiberchina, Altair Ruspol, JSC, Chem-Trend, Electroizolit, Joint-Stock Company, RightConsult, Ltd, Bauman Moscow State Technical University (BMSTU) took part in the event. 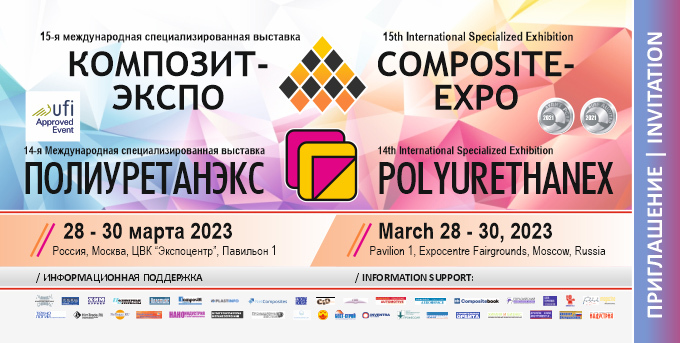 The International Specialized Exhibition “Polyurethanex” ran concurrently with the “Composite - Expo”, thus giving a wide circle of visitors-specialists an opportunity to see with their own eyes the innovation technologies and samples of integrated products of an actively developing branch of industry – production of new materials for different industries. According to the exponents’ appraisal, the effectiveness of the exhibition surpassed all expectations. It is evidence of the growing demands of the Russian market to use modern innovation technologies in the spheres of construction and housing and communal services, machine-building, ship-building, aviation-space industry, electronics and many others. Implementing the objectives of this major event in Russia, the exhibition is called upon to become an important marketing, scientific-and-research and analytical instrument for all its participants. Within the framework of the exhibition there ran the R&D conference “The Current State and Growth Prospects of Manufacture and Use of Composite Materials in Russia”, at which the specialists from the Union of Glass Fiber Producers, Stecloplastic, , LIBA GmbH (Germany) , Dow Chemical, Momentive Performance Materials Rus, LLC Steklonit, Avangard, Apateck, read their abstracts on the varioua aspects of the topic. The organizer of the exhibition – Exhibition Company Mir-Expo - established partner relationships with the organizing committees of the leading profile exhibitions: JEC Composites (France), China Composites Expo (China), Materialica (Germany), Composites Europe (Germany), Compotec (Italy) and others. The organizing committee got on the whole positive response on the exhibition. The majority of the exponents showed the intention to take part in the 3rd International Specialized Exhibition “Composite-Expo - 2010” next year. It’s planned to be held at February 24-26, 2010 in Crocus-Expo, Moscow. The 2nd practical-research seminar “Modern State and Prospects of Development of Production and Use of Composite Materials in Russia” was held in the frame of the exhibition.